Sooooooooooo many great pieces linked up last week! Thank you to all who joined in! To be honest, I had such a hard time choosing favorites this week as all pieces linked up were absolutely great! 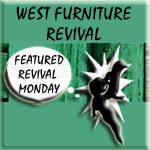 This week I’d like to highlight some things that are a little “out of the box” for Me… that means color! Bright beautiful color! Why is color so intimidating anyways? Anything pink would be one of those things. I grew up in a room that was violently pink! Pink bedding, curtains … even the carpet was pink! I literally lived in a pink world! It has taken me a long time to enjoy pink again. Mary from Orphans With Makeup has given me the pink bug I thought I’d never have again … I am smitten with her chest of drawers done in a soft pink. Soooooo soft and pretty! And I love how she styled it for pictures …. Bold, bright colors are”out of the box” for me … I wish I had the guts to do a piece of my own in a bold color like the one Susan from Saw, Nail and Paint chose for this sweet chest of drawers. It is beautiful and fresh and really makes the gorgeous hardware and details of this piece really stand out! You should go check out the before …. so much better now! 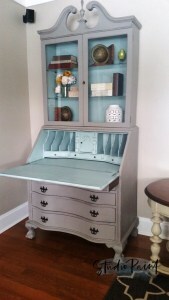 Studio Paint shared this amazing Secretary Hutch makeover. It is such a pretty place to sit and work … I would sit there all day if I had one of these! You should really go check it out! Well done! I love the pop of color on the inside! I wish I had a larger photo to share . Debra from Shoppe No. 5 shared this fresh table set. This set didn’t start out a set but you would never know it from how it looks now! Ahhhhmaaaaazing! Every piece was carefully chosen to make this beautiful set! You really must go check it out! So happy you could come, please feel free to link up both past and present makeovers … the more eye candy the better! Come share what inspires you! Happy linking! 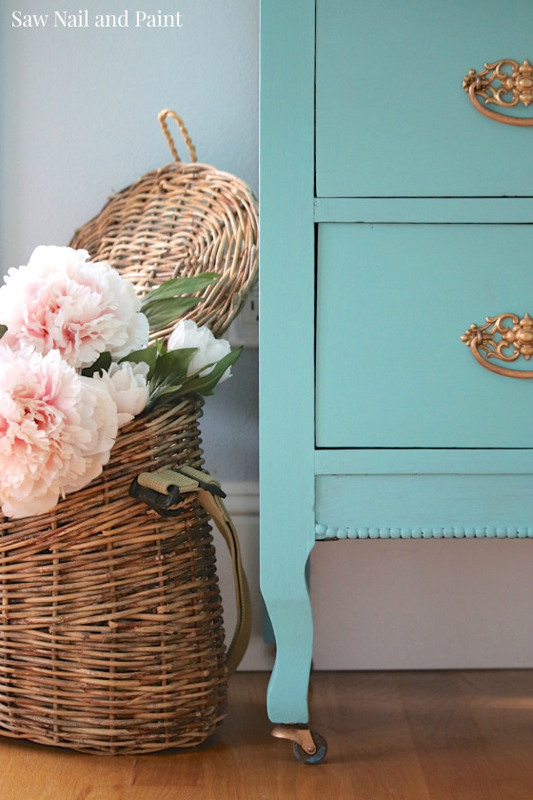 Thanks so much for sharing my Key West Blue dresser!! Oh do share when you’re done!!!! I hope you have a great day! Happy Painting! You are awesome Terry!! Thanks for choosing my Gov.Winthrop Desk/hutch to share with your readers. I will try and send you a larger picture to share. Maxine, I knew I loved your piece before I even clicked on it! Thank you so much for sharing it! You do lovely work and it is a pleasure to host you! Have a great weekend! 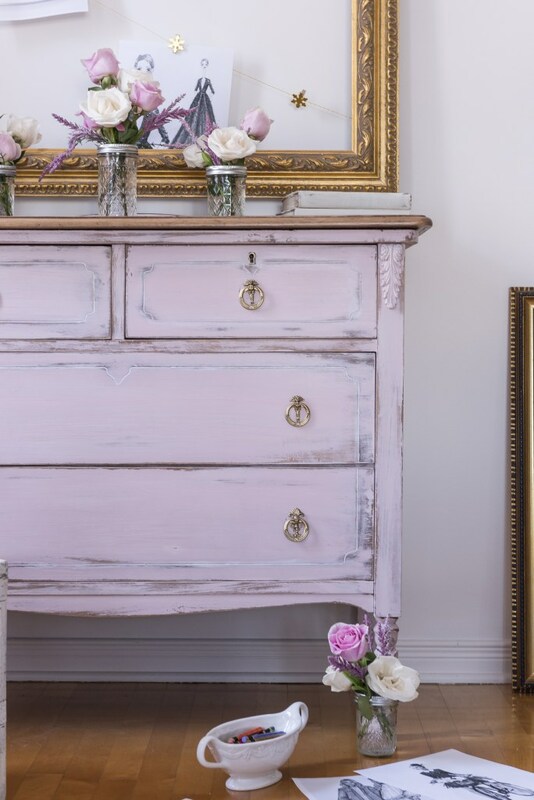 Thank you so much Terry for featuring my pink dresser. I have to say it was a little ‘out of the box’ for me too, but I was craving just a bit of color just about at this time of the year. I love all the other features. Great inspiration. Hope you are having a great day. You are so very welcome! 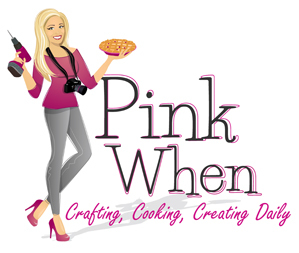 Pink done right is what you did! Love it! Thank you so much for joining in! i hope you have a great weekend! Thank you for hosting the party Terry! I love that secretary! Thank you for faithfully coming each week! I enjoy each link! Hope you enjoy a great weekend! 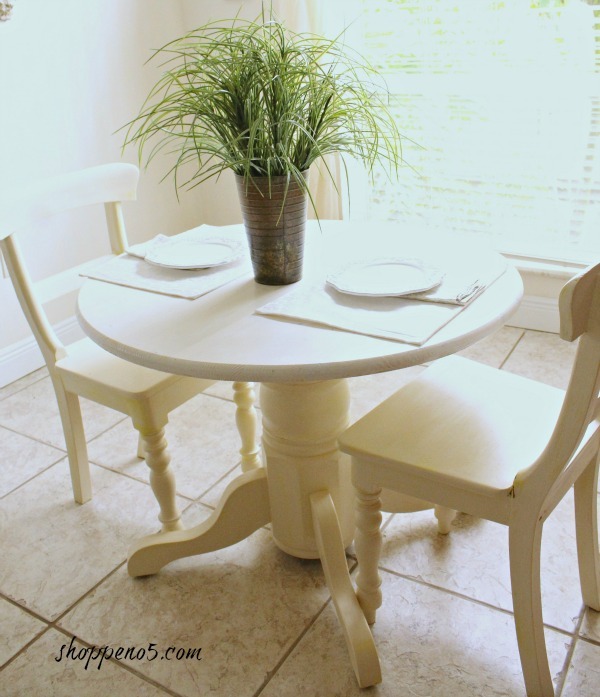 Thank you so much for featuring the little farmhouse table and chairs for two this week. I am truly honored to have been included this week. 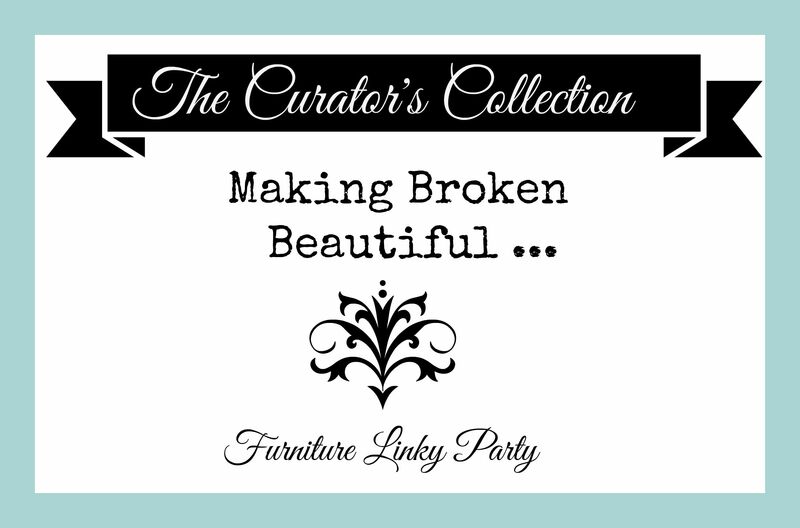 There are so many beautiful pieces. You are so welcome Debra! Thank you for inspiring! Have a great weekend! Thank you CoCo! You as well! All dreamy pastels! Nice choices missy. It’s time for the return of colour as far as I’m concerned so way to go! I agree! I hope you are enjoying the weekend! Finally, I have a piece of furniture to share! Thanks for the party (always enjoy this one) and hope you have a good weekend Terry. The weather sure is going to be nice from what I hear. Thank you for sharing your talents Marie! I hope to open the garage door this weekend and cut some wood if it’s nice! I can hardly wait for spring :) Hope you enjoy the weekend weather too! Thank you Cynthia! I hope you have a great weekend! We LOVE pink in adult spaces. The first piece with the gold hardware is stunning! It is gorgeous isn’t it? I love how rich the frame looks sitting on top with all those pretty flowers! Mary really did well! Hope you have a great week!